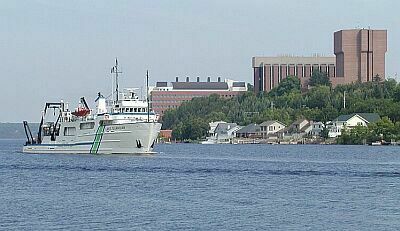 The U.S. Environmental Protection Agency's research vessel (R/V) Lake Guardian served as the classroom for the "Ecology of the Great Lakes" Institute attended by 20 science and math educators from throughout Michigan, July 7-13, 2002. The goal of the course is to enhance the ability and motivation of educators to teach about Great Lakes ecology. The course participants worked with EPA researchers using a variety of monitoring devices aboard the vessel. Samples of the new curriculum developed by teachers as a result of the course can be accessed from this website. Educators' Science and Mathematics Institute Series (co-sponsored by Dept. of Education, Dept. of Educational Opportunity, and Western Upper Peninsula Center for Science, Mathematics & Environmental Education). Joan Chadde, education program coordinator for the Western Upper Peninsula Center for Science, Mathematics and Environmental Education, was the course coordinator. 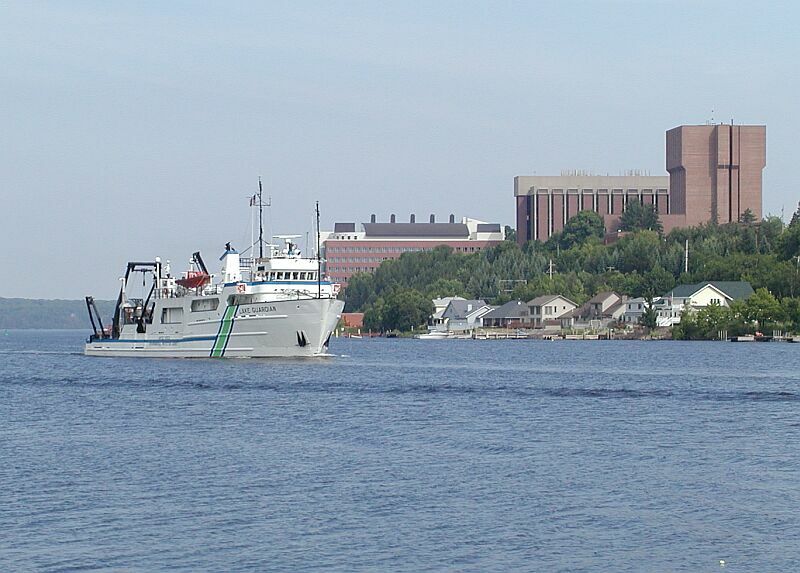 The Lake Guardian is the research vessel used by the Environmental Protection Agency (EPA) to gather data concerning the chemical and biological conditions of the five Great Lakes, and to monitor pollutant concentrations. It is fitted with state-of-the-art navigational, laboratory and mechanical equipment. As part of its long-term trends program, the EPA conducts monitoring surveys of the Great Lakes every two years. During each survey, samples are taken at eight to twenty pre-established locations (stations) per lake.